Agent Kim Hanlon fell seriously ill while on vacation; over $25K has been raised on GoFundMe to cover the costs of an airlift. Hanlon is now being treated in Miami. What was supposed to be a fun family getaway quickly turned into a living nightmare for Kim Hanlon, a real estate agent at Alante Real Estate in Plymouth, Massachusetts. 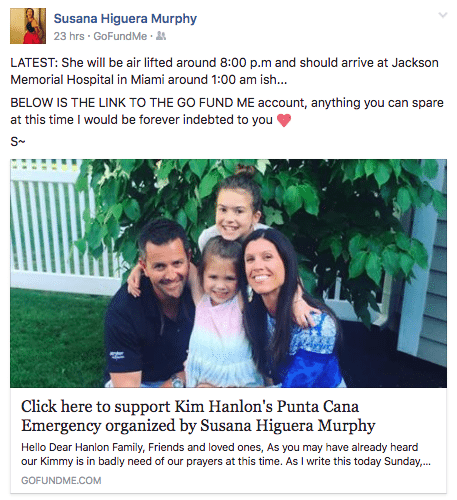 Susana Higuera Murphy, Hanlon’s friend and founder and CEO of Alante, recounted the story on a GoFundMe page she set up to alleviate the burden of the cost to transport Hanlon from Punta Cana in the Dominican Republic to Miami to receive proper medical care. Hanlon and her family were to arrive in Miami around 1 a.m. today, April 10, after being airlifted, according to a Facebook post from Higuera Murphy. Hanlon is currently being treated at Jackson Memorial Hospital. Higuera Murphy says on April 6, Hanlon told her she was in the hospital for nausea and extreme dehydration. “When she told me that last Friday I thought, good, you are in good care now, they will give you some sort of antibiotic and fluids and you will be on your way home,” Higuera Murphy wrote on GoFundMe. Two days later, she received a panicked call from Hanlon who described the lack of care she received from doctors as she waited alone in a room with no change of clothing, no assistance from nurses and no further diagnosis on her worsening condition. From there, Hanlon’s condition got worse as doctors gave her penicillin — a drug, that unbeknownst to doctors, she was allergic to. Fortunately, doctors were able to give her the antibiotic Z-Pak, but it was clear Hanlon couldn’t get the care she needed in Punta Cana. Her husband, Mike, couldn’t put her on a commercial flight back home, and he was scrambling to take care of their two young children as well. The only option was to medevac Hanlon to Miami, a flight that would cost in upwards of $20,000. 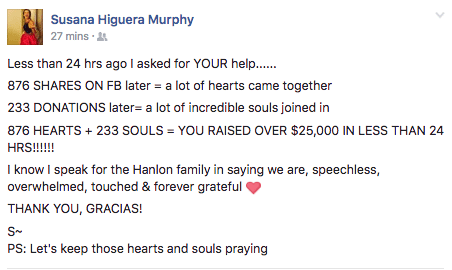 “20K but I don’t care,” Mike told Higuera Murphy, who quickly set up a GoFundMe page and filmed a passionate Facebook Live video asking friends, family, and colleagues to help Hanlon and her family. 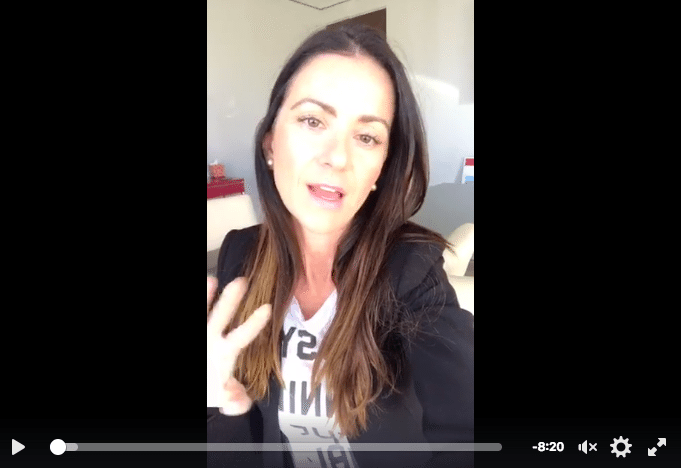 Click to watch Higuera Murphy’s video. “This fund is being created so we can help this family remove any financial stress at this time and let them concentrate on getting Kimmy healthy and back to her children, husband, family, friends and loved ones as soon as possible,” she says. 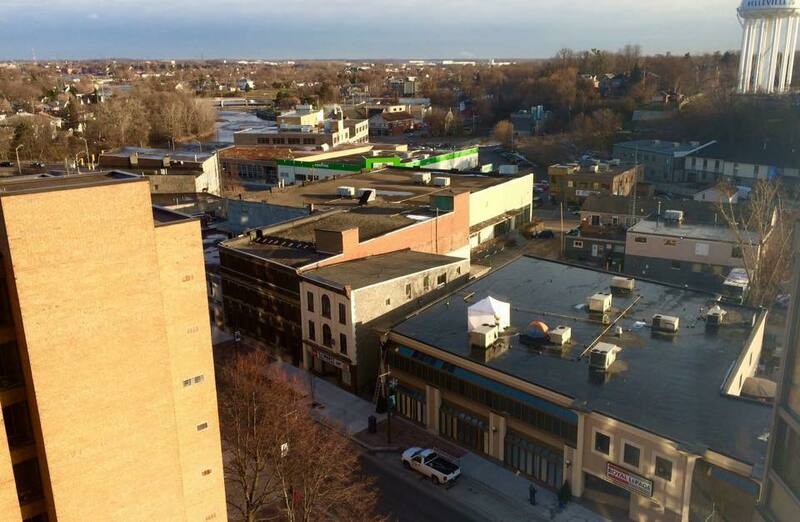 Within 18 hours, 190 people donated $19,801 — $5,199 shy of the $25,000 goal. By this afternoon, donors had exceed the $25,000 goal. “My sweet Kimmie! Thoughts and prayers have been sent your way for two days now… I hope you get better soon and you can be back with the girls and resting at home! We love you and miss you!! xx000,” wrote donor Anne Borghesani. “My thoughts and prayers are with you. I pray for your safe arrival to the states so you can be cared for properly. I send my positive thoughts to your husband and children in those most difficult time,” said another donor, Nicole Jarjura-Morgan. Higuera Murphy said she’ll be posting updates directly to the GoFundMe page, which would be easier than to answer the flood of texts, emails and phone calls she’s received from supporters inside and outside of the real estate industry.